When it comes to planning out a patio landscape, it can actually be quite an enjoyable process. There are so many different kinds of designs, materials, and routes you can take when creating the perfect patio. And with a little bit of creativity, you can create a patio that is sure to stand out. While creativity is beneficial to creating a unique patio, it is essential that you have a plan of some sort to follow along. It will make things much easier on you when it comes to actually building and designing. If something does not go as planned you can always change the plan, but having a plan to begin with makes things so much easier. So what should you be including in your plan? The first part of your patio landscape plan should include the focal point. What is it that you want to be the center of attention on your patio? 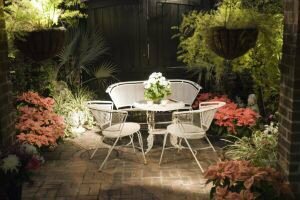 Whether it is a certain flower or plant arrangement with exuberant colors or a specific furniture placement, this will be the basis for the rest of the patio. Focal points help serve as the highlight of the design and catch the eye immediately. But within the focal point, try to stay with a theme to plan your design around. The theme can be based off of a number of things including color, materials included, sizes, and designs of the materials. Also consider what type of overall feel you would like the patio to give off. Are you aiming for a Victorian style or more of a Mediterranean style? Again, look at the outside of your home and try to apply your patio design to the design of your home. As for the accessories you want to include on your patio, it depends on what kind of feel you want to go with. While it is nice to get as much as possible to liven the patio, try not to overdo it. It becomes cluttered when you have too many plants and flowers, furniture, and other accessories like a fountain. You can certainly include all of these patio accessories, but keep it to a minimum so that the patio does not become cluttered. When considering building a patio, it can be a fun and enjoyable process. Having a plan can help the process go as smoothly as possible. While there are a number of things to consider when putting together your plan, these are a few of the key facets to consider when creating your patio landscape. If you touch on these facets, you will be on your way to creating a masterpiece.